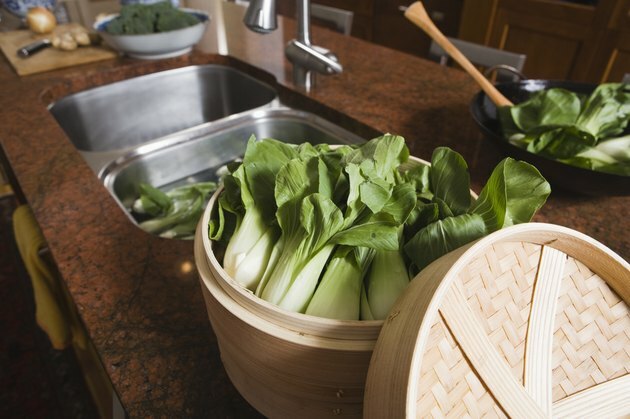 While green vegetables such as bok choy provide your body with many essential vitamins and nutrients, even healthy foods should be eaten in moderation. Too much raw bok choy can have a serious and potentially life-threatening effect on your thyroid gland, and medical professionals advise against overindulging in the raw version of this tasty vegetable. Hypothyroidism causes your thyroid gland to produce an inadequate amount of thyroid hormone. It is commonly caused by an autoimmune disease called Hashimoto's thyroiditis, which causes your immune system to attack your thyroid gland. Your thyroid gland produces hormones to regulate your metabolism; low levels of this hormone can cause symptoms such as weight gain, slow pulse, fatigue and constipation. Hypothyroidism is treated with synthetic or natural thyroid hormone drugs. Patients with hypothyroidism must take this medication daily to provide their bodies with the right amount of thyroid hormone. Bok choy, also known as Chinese white cabbage, contains compounds that inhibit thyroid function. When eaten raw, bok choy releases the enzyme myrosinase, which slows thyroid function and can potentially lead to hypothyroidism. "The New England Journal of Medicine" notes a case involving a woman who developed severe hypothyroidism with respiratory failure and myxedema coma after eating two to three pounds of bok choy a day for several months. While eating large quantities of raw bok choy can lead to hypothyroidism, cooking neutralizes the enzymes that decrease thyroid function. In reference to the extreme case of hypothyroidism described in "The New England Journal of Medicine," New York University resident physician Michael Chu notes that cooked bok choy would likely not have caused the woman's life-threatening reaction. Chu further suggests eating raw vegetables in moderation. Other raw vegetables in the same family as bok choy -- broccoli, kale, cabbage, Brussels sprouts and mustard greens -- may also negatively affect the thyroid. Soy products may also interfere with thyroid medication and cause impaired absorption. If you have hypothyroidism, talk to your doctor about how to plan meals that don't compromise your condition. Avoid eating too many raw vegetables, and see a doctor immediately if you develop any symptoms related to hypothyroidism.